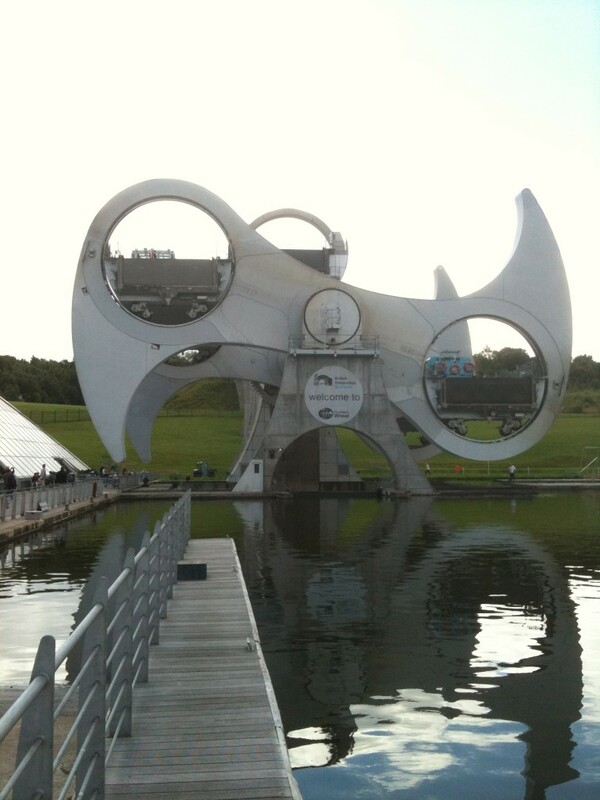 The Falkirk Wheel is the only rotating boat lift in the world. It’s a glorious example of someone taking something that could have been mundane and quotidian and instead creating a lovely, stylish solution. The centre of Scotland is crossed by two canals. In their heyday they were joined by a flight of 13 locks. But by the 1930s the heyday was long past and the locks were filled in a built upon. Jump forward to the 1990s when people are casting about for ways to spend the largess generated by the national lottery. Rejuvenating the canals was one project settled upon. The canals were cleared and at Falkirk they were joined by an innovative lift. The lift is made up of two enormous arms which rotate around a central spindle. Each arm has a huge gondola on a binnacle. A boat drives into the gondola, gates are closed tapping the boat and the surrounding water. The arms rotate. Half a million litres of water plus boats are raised, or lowered, by some 30 metres. The arms lock back in the perpendicular position and the boats drive out. Apart from the wonderful expression of style captured in this great engineering solution, the thing that amazed us is that the power used in performing this raising and lowering trick is equivalent to boiling eight kettles. We went up, or round, the wheel in a tour boat. I’m glad we did it, but can’t recommend it. 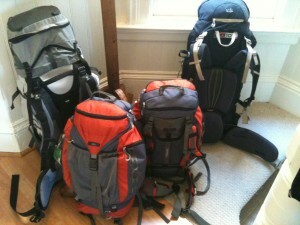 It’s an over-priced tourist trap of an experience, which had the boys almost asleep. If we were there again we’d just walk up for the view. As a place to visit, though, the Wheel was great. Apart from the Wheel, there are two great playgrounds and some pretty walks. 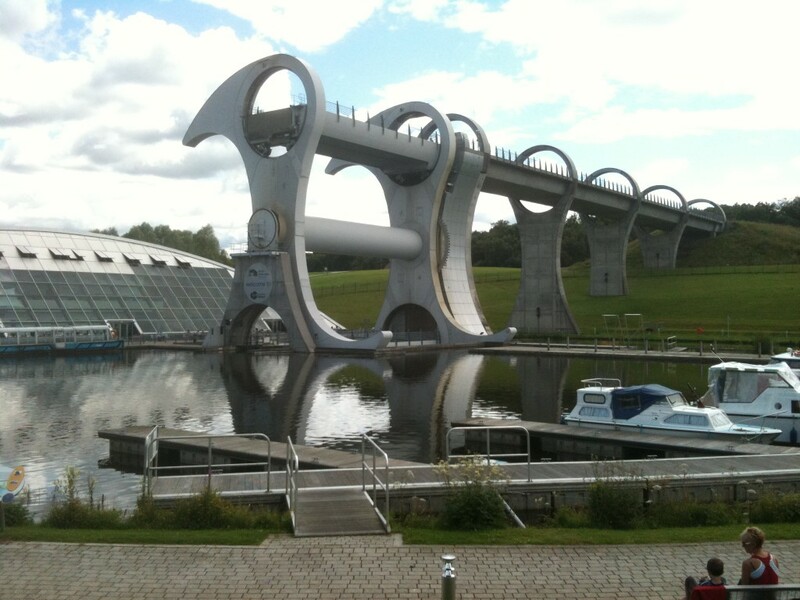 The Falkirk Wheel does not quite reach up to the level necessary to join the canals up. At the top there is an aqueduct, a tunnel and then two more traditional locks. This is all to protect the Antonine Wall and Rough Fort. The wall and fort are the remnants of an ambitious Roman attempt to hold the Caledonians back North of Hadrian’s Wall. The attempt lasted all of 20 years, but the traces of their efforts are still clear 2000 years later. Callum for the purposes of demonstration became the Scots while Declan was the Romans. Each represented whole groups (Cal a hoard, Dec an organized legion). They proceeded to battle all over the fort and all the way back down the walk to the base of the hill. We’re calling it a draw as the war only ended, in spite of Declan calling in a mounted Legion of reinforcements, when parental patience ended and the two sides were forcibly separated.